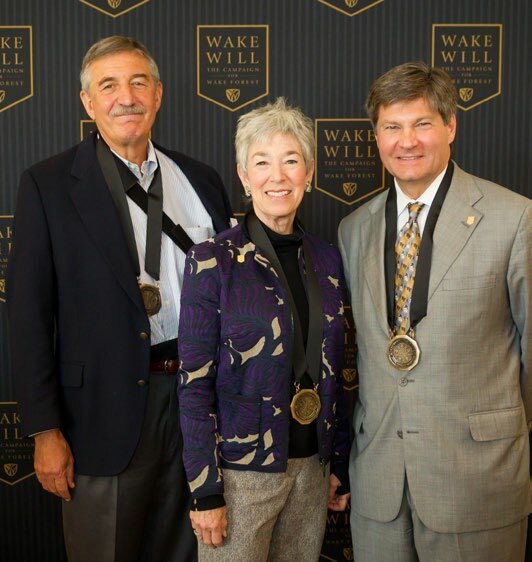 To recruit and retain outstanding faculty who embody Wake Forest’s teacher-scholar ideal, three alumni have committed $3 million to fund Presidential Chairs, the highest award the University can bestow on a faculty member. The announcement occurred at a Magnolia Room luncheon on Oct. 25. Bobby Burchfield (’76), a former vice chair of the board of trustees and a prominent Washington, D.C., attorney, made a $2 million commitment to the initiative and has established the Burchfield Presidential Chair of Political Economy. Mike (MALS ’13) and Debbie (MAEd ’83, MALS ’05) Rubin of Winston-Salem made a $1 million commitment and have established the Rubin Chair of Jewish and Israeli Studies. 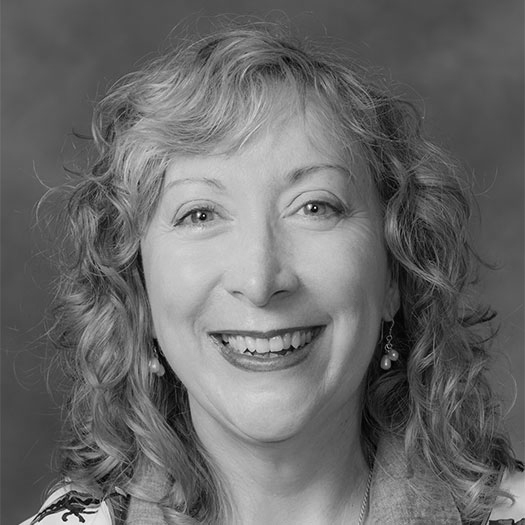 Debbie Rubin, a trustee, earned a Wake Forest counseling degree and a Master of Arts in liberal studies and worked as a counselor in the University Counseling Center for several years. Mike, a retired physician, earned a Master of Arts in liberal studies last May. Maria Henson (’82) asked them about their gifts to Wake Forest. Following are condensed, edited excerpts from the conversations. Maria Henson: Why did you decide to make such a substantial gift? What is it about Wake Forest that’s special for you? Bobby Burchfield: When I was here at Wake Forest I definitely knew that Wake Forest was unique and special — very small school, very intimate involvement by the faculty with the students, which I sensed my friends at other universities were not getting. In all of my travels and appearances on behalf of the University, I think the one unifying characteristic of Wake Forest alumni is almost every single one can tell at least one story of a transformational faculty member who took a personal interest in that particular student and literally changed his or her life. That certainly happened with me. Henson: Who was the professor? Burchfield: One was James Steintrager in the politics department from whom I took a number of political theory classes, and one was John Moorhouse from the economics department. I think both of them were in different ways very influential in the way I look at things today. Henson: Why the academic choice for the chair? Burchfield: I’ve had the opportunity to be involved in several political contexts — working with a presidential campaign and then working with senators and congressmen in connection with various political issues and constitutional issues. I began to think in terms of what could I do for the University that would provide the best grounding for our future leaders in public policy. The more I thought about it, the grounding I had in political theory and economics could be joined, and thus the idea for a chair in political economy. In my concept of the chair, it combines both the ‘what should government be?’ and ‘what should government do?’ and ‘what is the best public policy?’ — the political theory side of it — with ‘what are the costs and benefits of any particular mode or proposal that the government decides to pursue?’ That is the sort of analytical and conceptual grounding that our future leaders need to have to sort out some of the big problems they are going to face. Henson: Why did you decide to make your gift? Debbie Rubin: We believe in Wake Forest and we believe in the humanities. We have offered faculty support before. It’s the faculty in particular who make Wake Forest’s strategic idea of a premier, face-to-face University a reality. Mike Rubin: I’ve been involved in the MALS program for the last three and a half years. I heavily weighted my courses in history. I got to know the faculty and appreciate what they’re doing. Debbie: We sat down with (Dean) Jacque Fetrow and asked what courses would the history department like to offer that they can’t because of lack of resources, and the history department and Jacque came back to us with Israeli history and Jewish studies. So our interests meshed with the history department’s needs. Henson: What is your hope for the students who learn from that professor? Debbie: That they develop an understanding of the Middle East as a geographic area and a political area and understand the interconnectedness of our world. I think this program and this program’s professor may go a long way in expanding that idea of globalization. Henson: What is it about Wake Forest that’s special for you? Mike: I think it’s the strong faculty. We feel like it’s the linchpin of this University. We’ve had excellent administrations in our time, but it’s really the faculty in the trenches who (provide) the uniqueness that Wake Forest brings to the table. Debbie: What Mike’s not saying is that we both believe all politics is local. Number one: Wake Forest is our local University. If it weren’t the kind of school that it is, we wouldn’t feel so strongly. It is an institution that cares about its students. Mike: It’s a hands-on student/faculty experience. This is what I’ve seen in my history courses — all my classes — but really in the history department. They engage the students, challenge the students and make the students better. Debbie: And what I’ve noticed is that the faculty model civil discourse. We are in an age with a lot of spin and angry voices, and the professors model that civil discourse both within the class and in casual conversation.